17 – In number seventeen of Hold The Back Page, Ciarán and Chris talk about Ireland versus Norway, Steven Gerrard’s injury against France, Robert Pires, Michael Jackson look-a-likes, as well as how many people had a bet on Sunderland’s 3-0 win over Chelsea. Cathal Dervan of the Sunday Star is on the line to discuss Trapattoni’s future and the state of the Irish national team, while goalkeeping blogger Aidan Elder talks about Shay Given, Joe Hart and England’s ‘keeper situation. In ‘Tip/Off’ this week, we’ve selected Fulham v Manchester City. 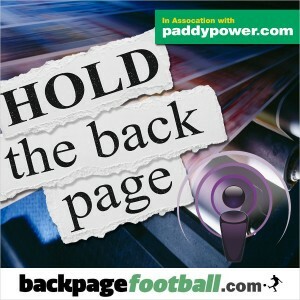 #15 – In episode fifteen of Hold The Back Page, Chris slips into Neil’s boots to talk about Gareth Bale’s recent form, Brian Kerr and other news topics. The Daily Telegraph’s Rory Smith is on the line to chat about the potential Red Sox revolution at Liverpool, while Rory’s Manchester colleague Mark Ogden talks Manchester City. Paul O’ Hehir of the Irish Mirror reels in the League of Ireland season, which saw Shamrock Rovers take the title. As usual, there’s regular features ‘Tweet The Press’ and ‘Tip/Off’. Enjoy!